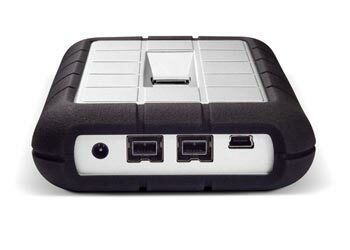 Safety is what the developers of LaCie had in mind when they designed their new Rugged Safe all–terrain hard disk. It comes in two versions: 500 Megabyte ($189.99) and one Terabyte ($299.99). Windows Vista®, Windows 7 and Mac OS X 10.5, 10.6. Dimensions: 90 x 28 x 145 mm / 3.5 x 1 x 5.7 in. Weight: 298 g / 10.5 oz. All information can be found at LaCie's homepage.